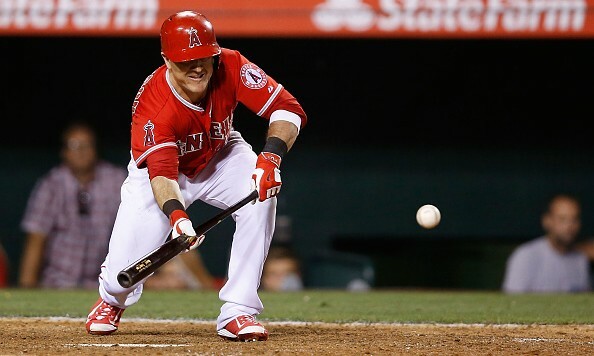 Second Guessing Scioscia – Bunt Party! In this edition of Second Guessing Scioscia we review one game in which our intrepid manager ordered not one, not two, not three but FOUR(!) bunts. It’s a bunt party!!!! Scioscia got the bunt party hopping right out of the gate with what might be the most egregious sac bunt of the year. Not just for Scioscia, I’m talking about all of baseball. It is the top of the first inning and Alfredo Simon has started the game off by walking Kole Calhoun on five pitches, giving up a hard hit grounder through the whole for a single to Mike Trout, a three-run homer to Albert Pujols and a double ripped into the gap by David Murphy. Clearly this is a pitcher who doesn’t have anything going at all. So what does he do with the next batter after Murphy? HE HAS ERICK AYBAR BUNT HIM OVER. OK, let’s try to get our head around this. Yeah, I got nothing. Maybe, and it is a very big maybe, Aybar bunted on his own. That absolves Sosh of some blame, but not much as Scioscia is responsible for creating a culture in which a hitter feels free to order up sac bunts independent of the coaching staff. Aybar did move the runner over and he did come into to score on a wild pitch, but the bunt also gave Simon a chance to calm down, compose himself and get the next two batters out. In fact, Simon pretty much cruised through the next two innings. Way to let him off the hook, Sosh. Fast forward to the fourth inning and Simon has put himself right back on the hook by giving up two singles and a walk to start the inning off. He even allowed a run to score on a wild pitch in the process of issuing that walk. That run actually gave the Angels back the lead. Up steps rookie Kaleb Cowart who… lays down a sac bunt. Once again, Alfredo Simon is teetering on the edge of collapse and Scioscia just gifts him an out. Aybar was at least a good bunter who might’ve been able to turn the attempt into a base hit. Cowart, however, is a rookie who has laid down seven sac bunts in his entire professional career. There is at least a little more sense for Scioscia here, not much, but a little. It is a tied game after all, one run gives them the lead, something the Angels haven’t had much lately. I guess there is some logic in not trusting a rookie to hit into a double play, but with the way Simon is throwing, I think the reward of Cowart teeing off on him like everyone else and breaking the game open greatly outweighs the chances of a GIDP. Just one inning later, Scioscia strikes again! Or at least I think he did. For some reason the official scorer didn’t call this one a sacrifice even though it certainly looked like one. Anyway, here we are with runners on first and second and one out. The Angels now have a four-run lead. There is ABSOLUTELY no reason to play for one run at this point. The Tigers have also brought in a new pitcher to try and stop the bleeding. Stop it he did because Ryan Jackson handed him the tourniquet by dropping what sure looked like a sacrifice bunt. I’m convinced the only reason it wasn’t scored that way was because even the official scorer couldn’t understand why anyone in their right mind would bunt in that situation. Ryan Jackson apparently was quite determined to get a sac bunt on his ledger for the night because he laid down another one in the eighth inning. This is easily the most defensible bunt of the night, though that’s not saying much. The Angels lead is now down to one and they have a runner on first with no outs in the top of the eighth. Jackson is at the plate and Jackson isn’t someone who, you know, does good things at the plate. Having him bunt might actually be his optimal outcome here. Still, our old, trusty run expectancy chart tells us that this bunt drops the run expectancy by .19 runs and the win expectancy by about 1.5%. Jackson can’t hit, but even he can’t do much more damage than that if left to his own devices. The bigger issue is that this is an Angels team that has been struggling to do anything at the plate for weeks and the one night they actually have something going, Scioscia gave away four outs. Giving away one seems like too many, but four… that’s just inexcusable.